The Act of the Re-Establishment of the State of Lithuania or Act of March 11 (Lithuanian: Kovo 11-osios Aktas dėl Lietuvos nepriklausomos valstybės atstatymo) was an independence declaration by the Lithuanian Soviet Socialist Republic adopted on March 11, 1990. 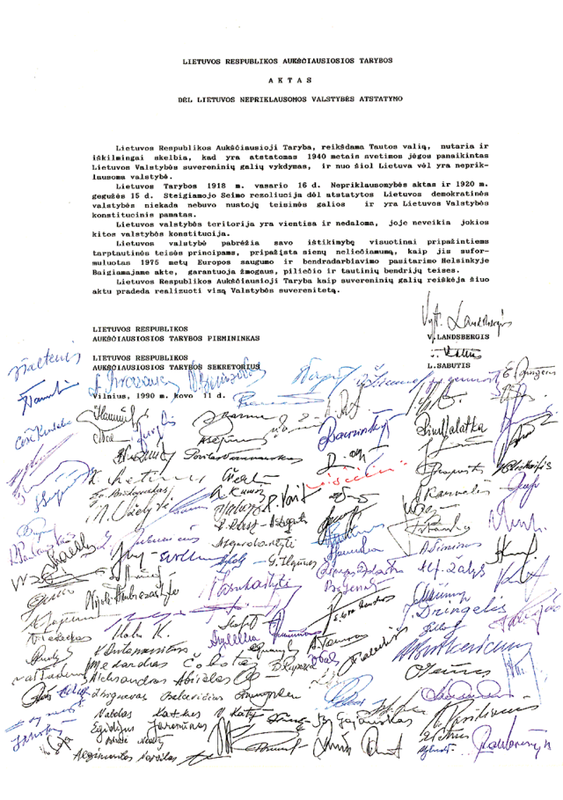 Signed by all members of the Supreme Soviet of the Lithuanian SSR. The act emphasized restoration and legal continuity of the interwar-period Lithuania, which was annexed by the USSR and de facto lost independence in June 1940. It was the first time that a Union Republic declared independence from the dissolving Soviet Union. After the partitions of the Polish–Lithuanian Commonwealth in the 18th century, Lithuania was part of the Russian Empire. In the aftermath of the Russian Revolution of 1917, the Council of Lithuania, chaired by Jonas Basanavičius, proclaimed the Act of Independence of Lithuania in 1918. Lithuania enjoyed independence for two decades. In August 1939, Soviet Union and Nazi Germany signed the Molotov–Ribbentrop Pact dividing Eastern Europe into spheres of influence. The Baltic States (Lithuania, Latvia, and Estonia) were assigned to Russia and converted into soviet socialist republics. The Soviet authorities undertook Sovietization policies: nationalization of all private property, collectivization of agriculture, suppression of the Catholic Church, and imposition of totalitarian control.Approximately 130,000 Lithuanians, dubbed “enemies of the people”, were deported into Siberia. Nonviolent resistance continued both in Lithuania and among Lithuanian diaspora. These movements were secret, illegal, and more focused on social issues, human rights, and cultural affairs rather than political demands. As Mikhail Gorbachev attempted to revive the economy of the Soviet Union, he introduced glasnost (openness) and perestroika (restructuring). These reforms encouraged changes within the Soviet government and invited the public into discussions. For the activists, it was an opportunity to bring their movements from underground into the public life. 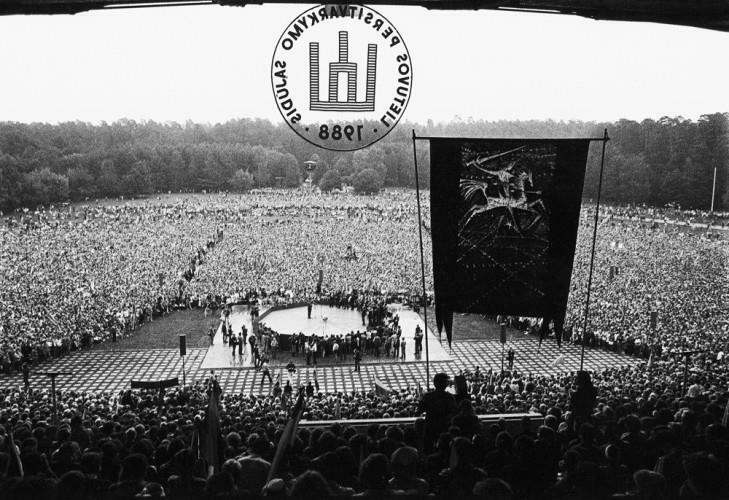 On August 23, 1987, 48th anniversary of the Molotov–Ribbentrop Pact, the Lithuanian Liberty League organized the first public protest rally that did not result in arrests. 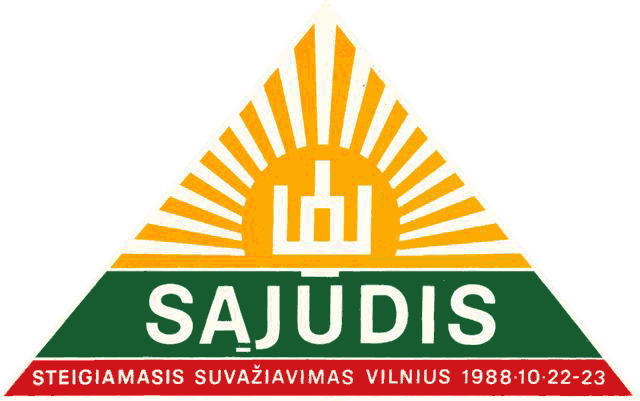 In mid-1988, a group of 35 intellectuals organized “Sąjūdis” Reform Movement with the officially stated goal of supporting, discussing, and implementing Gorbachev’s reforms. “Sąjūdis” grew in popularity, attracting many people. By the time of the Baltic Way, a human chain spanning over 600 kilometres (370 mi) across the three Baltic States to mark the 50th anniversary of the Molotov–Ribbentrop Pact, full independence was the official goal. 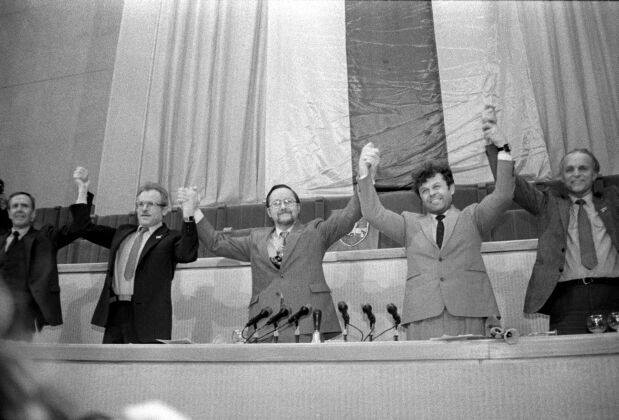 Parliamentary elections of February 1990 were the first free and democratic elections in Lithuania since World War II. The people overwhelmingly voted for the candidates endorsed by “Sąjūdis”, even though the movement did not run as a political party. The result was the first post-war non-communist government. During its first assembly on March 11, 1990, the Supreme Soviet of the Lithuanian SSR elected Vytautas Landsbergis as its chairman, changed its name to the Supreme Council of the Republic of Lithuania, and formally declared the re-establishment of the State of Lithuania. The act was approved at 10:44 pm by 124 members of the council while six abstained.There were no votes against. The Act of the Re-Establishment of the State of Lithuania served as a model and inspiration to other Soviet republics. However, the issue of independence was not immediately settled and recognition by other countries was not certain. 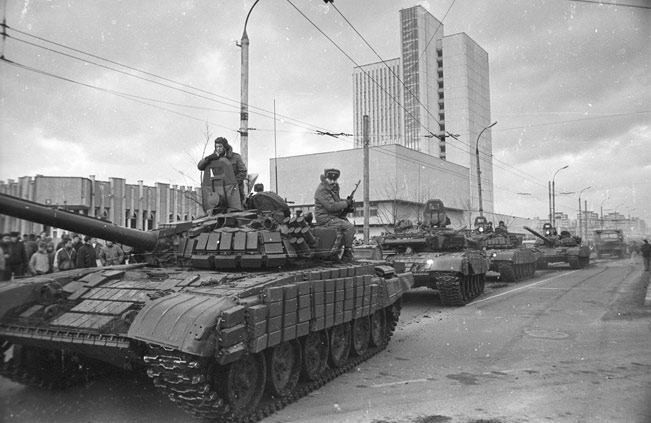 Mikhail Gorbachev called the Act of Independence illegal and the USSR demanded revocation of the Act and began applying sanctions against Lithuania including an economic blockade. 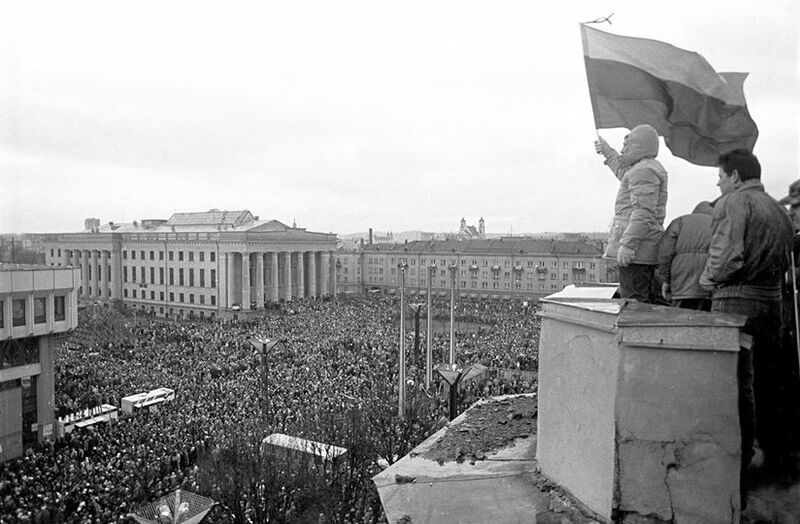 In addition, on January 13, 1991 Soviet forces stormed the Vilnius TV Tower. Unarmed civilian Lithuanians confronted Soviet soldiers. Fourteen people were killed and seven hundred injured in what became known as January Events. After January events Iceland was the first country to recognize Lithuanian independence on February 11, 1991. After the failed armed August Coup in Moscow, on September 6, 1991 Lithuania’s independence was recognized by the Soviet Union. Then recognition of Lithuania’s independence was quickly followed by several countries including Hungary, Bulgaria, Italy, Poland, Malta, San Marino, Portugal, Romania, Ukraine, Latvia and Estonia. On September 17, 1991, it was welcomed as a member of the United Nations along with Estonia and Latvia. The Supreme Council of the Republic of Lithuania, expressing the will of the nation, decrees and solemnly proclaims that the execution of the sovereign powers of the State of Lithuania abolished by foreign forces in 1940, is re-established, and henceforth Lithuania is again an independent state. The Act of Independence of February 16, 1918 of the Council of Lithuania and the Constituent Assembly decree of May 15, 1920 on the re-established democratic State of Lithuania never lost their legal effect and comprise the constitutional foundation of the State of Lithuania. The territory of Lithuania is whole and indivisible, and the constitution of no other State is valid on it. The State of Lithuania stresses its adherence to universally recognized principles of international law, recognizes the principle of inviolability of borders as formulated in the Final Act of the Conference on Security and Co-operation in Europe in Helsinki in 1975, and guarantees human, civil, and ethnic community rights. The Supreme Council of the Republic of Lithuania, expressing sovereign power, by this Act begins to realize the complete sovereignty of the state.